Besides polishing your pearly whites, that is! Here are some other ways that you can use toothpaste, aside from keeping your teeth clean and white! Regular toothpaste has stain removing power: red wine, food and other things on upholstery, carpets and more! Just use an old toothbrush and a dab of paste to pull up a stain on most fabrics. Note: whitening toothpaste will not only whiten your teeth, it will bleach any fabric you apply it to so make sure to only use it on textiles that were white to begin with! If you’ve ever chopped garlic or onions, you know that the odours these give off can stay on your skin for a while, even after you’ve washed your hands with soap and water. One way to neutralize the odour is to clean your hands with a little water and toothpaste. 3. Run out of hair gel? Gel toothpaste will do the job in a pinch and leave you trailing a minty fresh scent, in the bargain! Use a dab of toothpaste on mosquito bites to stop the itch cold. Just make sure you don’t use the gel varieties for this, as that will sting! If you’ve got scuffed up leather shoes or boots and no leather cleaner or moisturizer around, a dab of toothpaste on a dry cloth, rubbed over the scuffs and then removed with a clean damp cloth should see you on your way to scuff free clodhoppers! If you’re partial to running shoes white rubber toes or sides, you can clean these up when they get dingy with non-gel toothpaste and an old brush! Just as with scuffs, all you need to do is wipe them off with a clean, damp cloth afterwards, for a brand new looking shoe! 6. Run out of sanitizer? A little toothpaste and water will do in a pinch, though why you’d have a tube of paste handy if you don’t have any sanitizer is a question for another time! If you happen to have any, diamond rings do very well in the sparkle department after a shine up with a toothbrush and paste. Once you’ve got your shine back, just remove any residual paste with a damp cloth. If diamonds aren’t your thing, this trick will also work with silver that has tarnished too. And if you’ve got chrome fixtures in your bathroom or kitchen, non-gel toothpaste will do the trick! Spread it on and then shine and wipe with a dry cloth! Did a guest recently put a sweating glass of something delicious on your wooden coffee table, without a coaster, leaving behind a water ring? No problem! Just rub some non-gel paste into the ring and then wipe it off with a damp cloth. The ring should come off beautifully; just let is all dry up before waxing or polishing! After years of use, piano keys can start to take on a dingy appearance. Give them a light scrub with toothpaste and an old toothbrush and wipe them clean again with a damp cloth. If you’re a swimmer, you’ll probably have experienced your goggles fogging up on you. Try this: smear a bit of toothpaste on each lense, wipe it off completely and you should be fog free for a while! This works for bathroom mirrors as well: just wipe some on to the mirror—perhaps just the part you need for your face—and then wipe it off. When you’re done you’re shower, you’ll still be able to see yourself, without the fog! And if your car headlights are fogging up, use this technique to stop that too! Just wipe on the paste and scrub in circles. Then wipe it off. Voila! 11. Take etching scratches out of glassware and even screens! A little toothpaste rubbed into the scratches will reduce their appearance dramatically! This technique will also work with watch faces, CDs and DVDs and more! A bit of toothpaste and a brush is your best solution to crayon on the walls… or on tables, doors or other places around your house. Ideally of course, the kiddos won’t colour those surfaces in the first place, but if they do, a little elbow grease will help you to banish mini-Picasso’s work! You might also like this post about vaseline uses. It’s clear that toothpaste is an all round solution for a range of problems and improvements around the house. 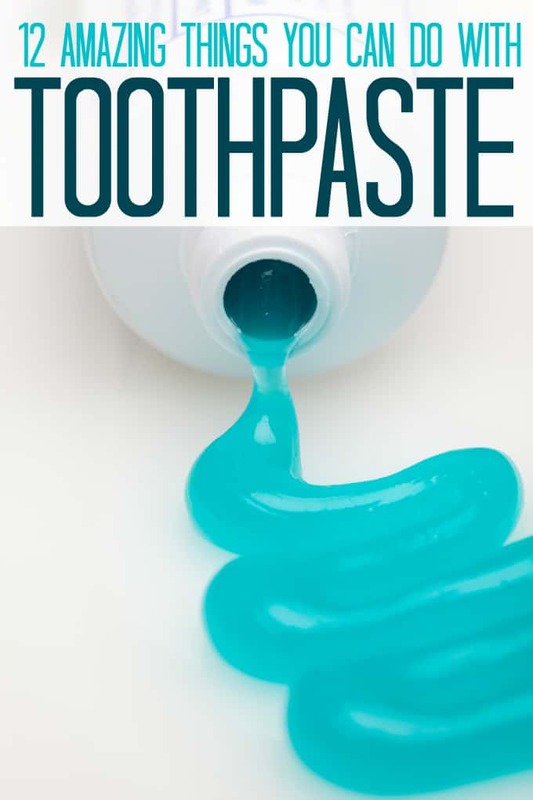 Do you have any special uses for toothpaste that we haven’t mentioned here? These are really good tips to do with using toothpaste. I will have to remember to use toothpaste to get out water stains on my coffee table and I did not know that using toothpaste on a bug bite stops the itching. I will try this next time. I have to say, I haven’t heard hardly any of these suggestions for using toothpaste – I want to try several of these ideas! Very interesting . . .now i have to put these into my brain in a place where i won’t forget where i put them, LOL. There are times when they will be very handy . Thanks for sharing. These are great tips for using toothpaste. Wow,i can’t believe all the way you can use toothpaste! Tried and true. I was visiting my sister-in-law Mary and she was distraught that her daughter placed a towel on her coffee table and ironed a blouse. Result steam stained the coffee table and left a heck of a mark. What I found that worked was 1 tbsp baking soda/1 tbsp white Colgate toothpaste. Swabbed spot and gone ! A lot of this I didn’t know! Very interesting information! Thanks for sharing. I’m definitely going to try the bug bites one! Thank you for all your information about toothpaste. I especially like the one about taking the sting out of mosquito bites. We have lots of mosquitos about this time of year-actually any time of year except when we have frost! I had no idea that toothpaste had so many different use. Thank you for sharing with us.